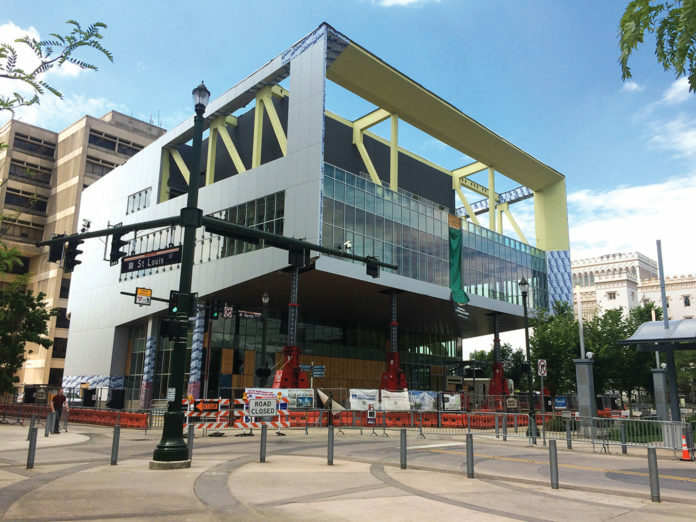 Construction could resume as soon as next week on the downtown library, which has been on hold since last April, when a faulty weld caused a structural failure in the building’s signature cantilever overlooking North Boulevard Town Square. In preparation for the work, crews have created a staging area and moved a crane and scaffolding into place to enable the remediation to begin. Engineers have estimated it will take about seven months to complete the $2.75 million worth of repairs to the structure. Resolving the lawsuits over the issue will likely take a lot longer than that. The city-parish has sued its program manager/architect on the project, WHLC. Through its insurance company, WHLC has, in turn, blamed a subcontractor for the error—a Houston-area structural engineering company—that, in subsequent court documents, has pointed the finger at yet another, Mississippi-based subcontractor. General contractor Buquet & Leblanc, originally named as a defendant in the suit, has since been released from the litigation. While the case wends its way through the 19th Judicial District Court, a process that could take years, WHLC will resume its role as program manager, representing the city’s interest in overseeing completion of the project. If it seems awkward that the city would be suing the same firm that will continue to represent its interest in the project, it is. But city-parish officials say they really have no choice. “They are the program manager and also the architect so there is really no way in the middle of a project that another firm would come in and take this on,” says Chief Administration Officer Darryl Gissel.